In March of 2000, I purchased 64 acres of fallow farmland which was originally part of the Governor Almond estate (He was the Governor of Virginia in the late 50's/early 60's) It was one of those types of deals one stumbles into once in a lifetime. About 50 acres is open field, with the remaining in hardwood timber. It is situated in a high area where it drops off about 250 feet over 5 miles to the NE and about 150 feet over 3 miles to the SW. South and NW drop off slightly over a few mile distance. Long 38.316021 Lat. -77.808476, which is about 20 miles S/SW of Fredericksburg, VA in Orange County. Later that summer, I built a 40 x 90 foot 'garage' that included a 20 x 40 foot hamshack, which is fed, by itself, from a 200 amp service panel. Each station has it's own circuit for 120 volts and 240 volts. Additionally, with radio in mind, a foot deep ditch was dug into 18 - 8 foot ground rods were installed, connected by 2 inch wide copper, around the perimeter. Both ends of this loop terminate on a 18" x 24" x 1/8" red naval brass panel. This is right where the utility service is located, so that ground was tied to the same panel and ground rods. 2 tons of central A/C was installed for the shack, along with a 5 ton unit for the rest of the garage. I figured it could get hot in there. In 2005, we built a house on the lot, close to, but separate from the 'man village' garage. Because one of my other hobbies is classic muscle cars, in 2006 we expanded the garage with a 40' x 115' addition. Not too much has changed since this except the towers have grown up and out of the ground. It's been a slow process because 99% is done by 'the guys', with a majority of the tower and tower parts being acquired locally for almost nothing. 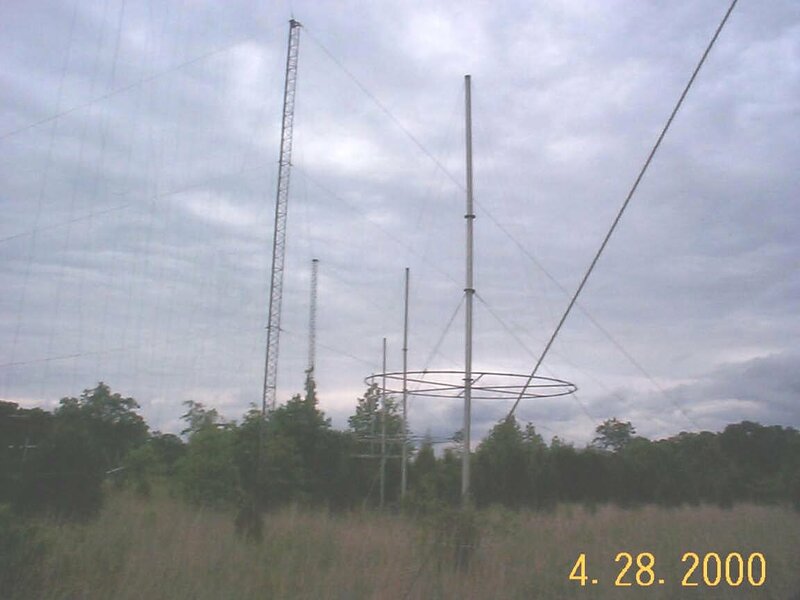 One group of towers came from Vent Hill US Army Security Station (Cold War listening post) and another from a US Gov't Communication site that was being de-commissioned. 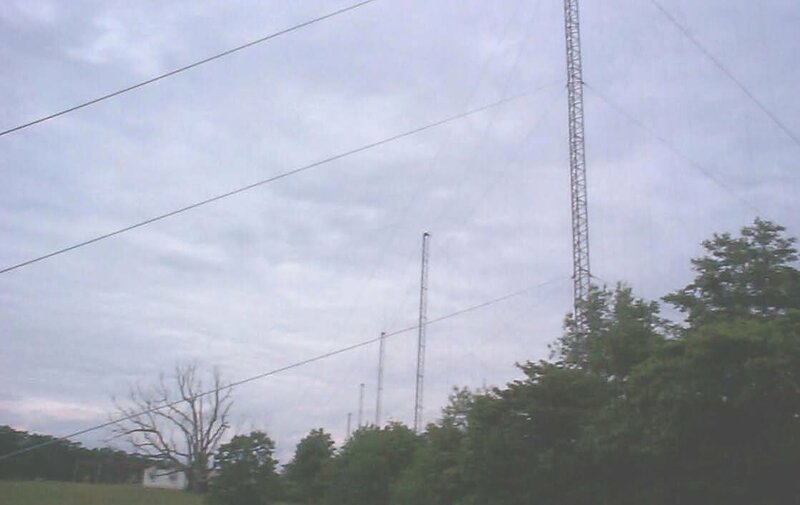 6 - 90 foot AB-105 towers, all hardware and 16 - 30 foot tall HF conical monopole antennas for $200. Of course, we had to take them down. The conical monopoles would later be used to build a 80 meter, 4 square array, with 6" dia elements. Currently, my neighbor is grazing about 200 goats and sheep on the property. I haven't had to do any bushhogging in 3 years, which is a good thing.